This article is about a type of yoga. For one of the six Hindu philosophy schools, see Yoga (philosophy). For other uses, see Yoga (disambiguation). In Sanskrit texts, Rāja yoga (/ˈrɑːdʒə ˈjoʊɡə/) was both the goal of yoga and a method of attaining it. The term also became a modern name for the practice of yoga, when in the 19th-century Swami Vivekananda equated raja yoga with the Yoga Sutras of Patanjali. Since then, Rāja yoga has variously been called "royal yoga", "royal union", "sahaj marg", "classical yoga", and "aṣṭāṅga yoga". Rāja (Sanskrit: राज) means "chief, best of its kind" or "king". 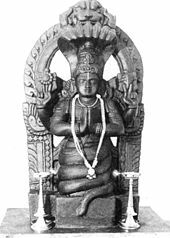 Rāja yoga thus refers to "chief, best of yoga". The historical use of the term Rāja yoga is found in other contexts, quite different than its modern usage. In ancient and medieval Sanskrit texts, it meant the highest state of yoga practice (one reaching samadhi). Hatha Yoga Pradipika, for example, refers to Hathayoga as one of the ways to achieve Rāja yoga. The first known use of the phrase "Rāja yoga" occurs in a 16th-century commentary on a specific step in the Yoga Sūtras of Patañjali. The Hindu scholar Dattatreya, in his medieval era Tantric work named "Yogaśāstra", explains in 334 shlokas, principles of four yoga: Mantra yoga, Hatha yoga, Laya yoga and Raja yoga. Alain Daniélou states that Rāja yoga was, in the historic literature of Hinduism, one of five known methods of yoga, with the other four being Hatha yoga, Mantra yoga, Laya yoga and Shiva yoga. Daniélou translates it as "Royal way to reintegration of Self with Universal Self (Brahman)". The term became a modern retronym when in the 19th-century Swami Vivekananda equated raja yoga with the Yoga Sūtras of Patañjali. This sense of meaning is different from Hatha Yoga Pradīpikā, a text of the Natha sampradaya, where it is a different practice. The Brahma Kumaris, a new religious movement, teaches a form of meditation it calls "Raja yoga" that has nothing to do with either the precepts of Hatha Yoga or Patañjali's Yoga Sūtras. Modern interpretations and literature that discusses Raja yoga often credit Patañjali's Yogasūtras as its textual source, but many neither adopt the teachings nor the philosophical foundations of the Yoga school of Hinduism. This mixing of concepts has led to confusion in understanding historical and modern Indian literature on Yoga. The Shaiva Yoga text, Amanaska, dated to be from the 12th century CE or earlier, is a dialogue between Vamadeva and deity Shiva. In the second chapter, the text mentions Raja yoga, and explains why it is called so. It states that it is so named because it enables the yogin to reach the illustrious king within oneself, the supreme self. Raja yoga is declared as the goal where one experiences nothing but the bliss of the undisturbed, the natural state of calm, serenity, peace, communion within and contentment. amanaska, advaita, niralamba, niranjana, jivanmukti, sahaja and turiya denote the same state of being. When the breath becomes exhausted, and mind becomes Praliyate (still, reabsorbed), they fuse into union called samadhi. This equality, this oneness of the two, the living self and the absolute self, when all Sankalpa (desire, cravings) end is called samadhi. Some medieval era Indian texts on Yoga list Rajayoga as one of many types of yoga. For example, the Sarvanga yoga pradipikå, a Braj-bhashya commentary by Sundardas, from the 17th-century, teach three tetrads of Yogas. The first group is Bhakti yoga, Mantra yoga, Laya yoga, and Carcha yoga; the second group is Hatha yoga, Raja yoga, Laksha yoga, and Astanga yoga; the third is Samkhya yoga, Jñana yoga, Brahma yoga, and Advaita yoga. Of these twelve, Sundardas states that Rajayoga is the best yoga. One meaning of Raja yoga is as a modern retronym introduced by Swami Vivekananda, when he equated raja yoga with the Yoga Sutras of Patanjali. After its circulation in the first half of 1st millennium CE, many Indian scholars reviewed it, then published their Bhāṣya (notes and commentary) on it, which together form a canon of texts called the Pātañjalayogaśāstra ("The Treatise on Yoga of Patañjali"). There are numerous parallels in the concepts in ancient Samkhya, Yoga and Abhidharma schools of thought, particularly from 2nd century BCE to 1st century AD, notes Larson. Patanjali's Yoga Sutras may be a synthesis of these three traditions. From Samkhya school of Hinduism, Yoga Sutras adopt the "reflective discernment" (adhyavasaya) of prakrti and purusa (dualism), its metaphysical rationalism, as well its three epistemic methods to gaining reliable knowledge. From Abhidharma Buddhism's idea of nirodhasamadhi, suggests Larson, Yoga Sutras adopt the pursuit of altered state of awareness, but unlike Buddhism which believes that there is neither self nor soul, Yoga is physicalist and realist like Samkhya in believing that each individual has a self and soul. The third concept Yoga Sutras synthesize into its philosophy is the ancient ascetic traditions of isolation, meditation and introspection, as well as the yoga ideas from the 1st millennium BCE Indian texts such as Katha Upanishad, Shvetashvatara Upanishad and Maitri Upanishad. In early 11th century, the Persian scholar Al Biruni visited India, lived with Hindus for 16 years, and with their help translated several significant Sanskrit works into Arabic and Persian languages. One of these was Patanjali's Yogasutras. Along with generally accurate translations, Al Biruni's text has significant differences than Yogasutra manuscripts discovered in India, during the 19th century. Al Biruni's record has helped modern scholars establish that Patanjali's Yogasutras manuscript existed in India in many versions, each with multiple commentaries by Hindu scholars. Some of these versions and commentaries have been lost or yet to be found. Al Biruni's translation preserved many of the core themes of Yoga philosophy of Hinduism, but certain sutras and analytical commentaries were restated making it more consistent with Islamic monotheistic theology. Al Biruni's version of Yoga Sutras reached Persia and Arabian peninsula by about 1050 AD. In Indian historical timeline, marking with the arrival of Islam in India in twelfth century, further development and literature on Yoga philosophy of Hinduism went into decline. By the sixteenth century, Patanjali's Yoga philosophy was nearly extinct. Yoga was preserved by sadhus (ascetics, sannyasis) of India. Some of the Hindu yoga elements were adopted by Sufi sect of Muslims in India. The Sufi Muslims at times adopted and protected the Yoga tradition of Hindus during the Islamic rule of India, and at other times helped the persecution and violence against those Hindus. The Mughal Emperor Akbar, known for his syncretic tolerance, was attracted to and patronized Yoga philosophy of Hinduism. ^ a b c d Mallinson-1 2011. ^ a b Mallinson-2 2011. ^ Michaels 2004, p. 267. ^ a b c Feuerstein 1978, p. 108. ^ White 2014, pp. 6-9. ^ White 2014, pp. 6-16. Feuerstein, Georg; Wilber, Ken (2002). "The Wheel of Yoga". The Yoga Tradition. Motilal Banarsidass Publishers. ISBN 978-81-208-1923-8.